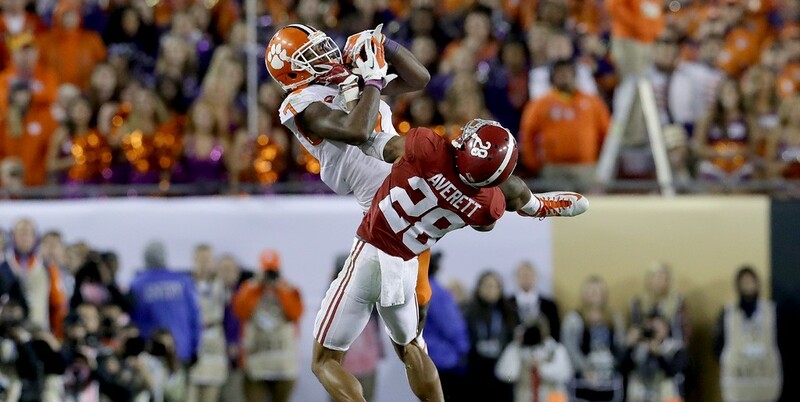 Last night, the University of Clemson Tigers upset the Alabama Crimson Tide in the most entertaining fashion, scoring the go-ahead touchdown with just a second left. And it wasn’t just a victory for Clemson, or its semi-insane head coach Dabo Swinney, or the student body, or the fine people of southwestern South Carolina. It was a victory for the very soul of college football. Clemson beat Alabama, whose brand of dull, technically proficient football has both plagued and dominated college football for the better part of the past decade. The primary reason people like me prefer college football to the NFL is that the game is more fun, quirky and unpredictable at the collegiate level. NFL head coaches live in constant fear of being fired, and are therefore scared to take risks. Any experiment that goes afoul can be grounds for firing. The result is a stultifying level of sameness across NFL teams. Even the most inventive coaches lose their creative energy when they enter the league. Chip Kelly was hailed as one of the most innovative offensive minds in football during his tenure at Oregon University, where he filled his team with track stars and ran a high-speed offense designed to exhaust the opposing defense. He also used boards filled with random images to call in his plays, which was fun. But his time in the NFL has been underwhelming. He briefly tried to implement a college-style, shotgun option scheme as head coach of the Philadelphia Eagles before reverting to the same tired pro-style offense every other team runs. But in NCAA football, creativity is not only encouraged but rewarded. Teams compensate for their talent deficiencies by running trick plays, fake punts and gimmicky offenses. This was best exemplified by the 2007 Fiesta Bowl, in which underdog Boise State beat the powerhouse Oklahoma Sooners in overtime using a trio of trick plays, including a hook-and-ladder, a running back pass and the Statue of Liberty. If you enjoy offensive linemen blocking in perfect unison; ball-hawking defenders with flawless tackling technique; wide receivers who run routes with surgical precision; running backs who possess a seemingly unfair combination of size and speed; special teams cover guys who always stay in their lanes; unexciting run-heavy, play-calling; and players who generally never commit penalties and execute their responsibilities with a military-like discipline, then Alabama is the football team for you. Alabama’s uncharismatic brand of football is a product of the team’s humorless automaton of a coach, Nick Saban, whose perfectionism is both legendary and pathological. He works 16 hours a day and allows himself only two weeks of vacation a year. He eats the same meal for lunch every day — a bland salad of iceberg lettuce, tomatoes and turkey — to cut down on decision fatigue. Anything that’s not directly related to improving his football team — the speaking engagements, the press conferences, the booster club meet-and-greets — he considers a needless distraction. He’s so focused on football that he forgot November 8 was Election Day. He makes no effort to hide his contempt for the press, which wastes his time with inane questions, and frequently eviscerates reporters who dare question his decision-making. He not only resists innovating the game, he actively disdains it. He hates teams adopting up tempo, no-huddle offenses, questioning whether that style of play constitutes “real” football. Nothing brings this man joy — not even winning. Earlier this season, he publicly lambasted his team’s first half performance in a game they won 31–3. Saban wasn’t even happy when his 2012 Alabam team won the national championship. The experience cost him a week of recruiting, he said. This obsession with success has garnered several comparisons to Satan, including from a former subordinate. Others have likened him to Hitler, which is arguably worse in this political climate. Whatever you think of his methods, they got results. His tenure at Alabama has been one of the most dominant in college football history. In 10 years with the program, he’s appeared in five national title games and won four of them, with a win percentage near 90. Saban’s Alabama teams didn’t do anything particularly exciting. They played unremarkable football; they just did it better than everyone else. They were as joyless and boring as their coach, which is why their defeat last night was so satisfying. Two of Clemson’s touchdowns last night, including the winning one at the end of the game, occurred on “pick” plays, where receivers run crossing patterns designed to make the opposing team’s defensive backs run into each other. Saban would never admit it publicly — he’s far too proud for that — but I’ll bet in his quieter moments he thinks Clemson won by resorting to a cheap gimmick instead of manning up and trying to play Alabama the right way. After the game, Clemson head coach Dabo Swinney was brought to tears, saying his team won because they loved each other. When Alabama won the national championship in 2012, Saban got pissed at his players for giving him the customary Gatorade bath. It’s impossible not to appreciate someone who’s as committed to their craft as Saban. But he’s also the epitome of the toxic alpha male. A man who’s so consumed with his work it leaves him little time for meaningful relationships. A man whose wife has had to abandon her professional dreams so he can obtain his. A man who, even in adulthood, strives to meet the unattainable expectations of his emotional withholding, long-deceased father. And it’s hard not to appreciate a control freak such as that lose to a coach who’s not afraid to publicly profess his love for his players. Saban wants football to be as mechanical and devoid of personality as he is, and in many ways he’s done just that at Alabama. But sports are meant to be fun, man, and last night fun won out, thankfully.